INFINITI vehicles offer their owners an unparalleled blend of performance, safety, technology, design, and luxury. The INFINITI lineup has grown and evolved in recent years and has often been praised by owners as well as by the automotive press. Come find out why today at Morrey INFINITI. There is something for every need and every budget in the INFINITI lineup. Come drive the brand-new Infiniti Q50 today, or the spacious and technologically-advanced Q70. If you need a little more room, the Infiniti QX80 is waiting for you. If performance combined with versatility is what you’re after, then the sporty Infiniti QX60 will surely put a smile on your face. Morrey INFINITI also offers its distinguished guests a wide selection of QX50 models. When you come to Morrey INFINITI to learn more about our selection of quality luxury INFINITI vehicles, you will be greeted with a smile and treated with respect by our dedicated team of experienced sales representatives. 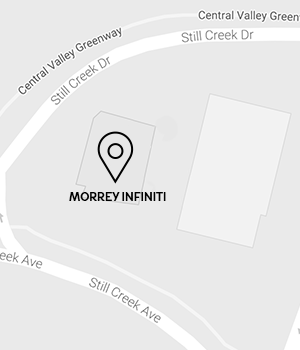 At Morrey INFINITI, we strive to make buying a luxury vehicle exactly as it should be, and your satisfaction is our only priority. Morrey INFINITI in Vancouver near Richmond also offers a wide range of affordable financing and leasing solutions that will be explained to you in a calm and enjoyable environment. To book your test drive today, contact us at 604 676-6972, or online using our contact form. We will get back to you as soon as we receive your application.